I've made my 11th or 12th trip into the BWCA [Boundary Waters Canoe Area] last week. Thanks to Blogger for adding scheduling posts, my site updated successfully while I was away! So bare with me for a couple days as I post some of my favorite trip photos. This is a night time photo from our camp site. 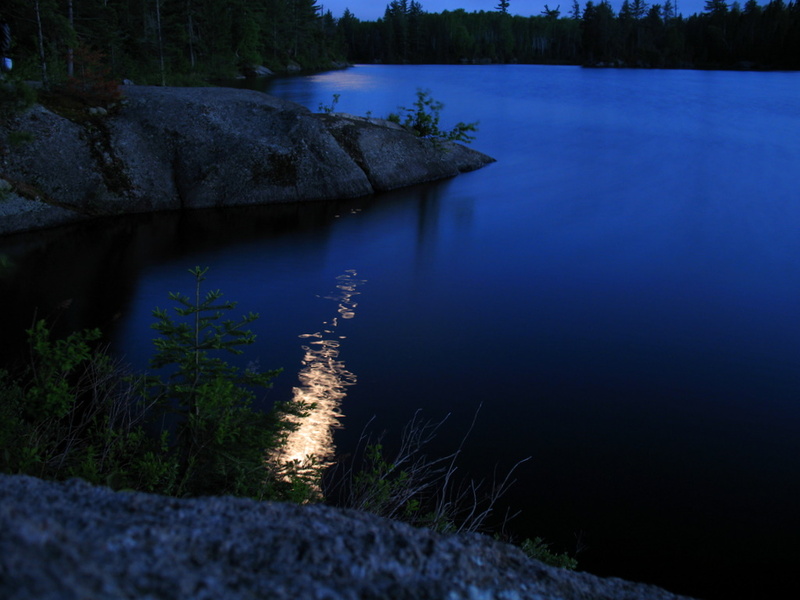 The light reflection in the water is the moonlight. Camera settings: 15 seconds, ISO 80, f/2.8. I used my Joby flexable Tripod, was perfect for the rocky and uneven surface. The water looks so peaceful. A great place to camp I am sure. Wow! I'm so glad you finally got to go! Great shot here. I love the blue in the water and the twilight all around. I can't wait to go here someday. I also can't wait to see more of your shots from your trip! Awesome. This brings back sooooo many memories. I grew up in SW Minn and for our Boy Scout summer adventures the Troop would take the older/experienced scouts for an 8 day BWCA trek ... that was in the late 60s ... me personally, I have 3 BWCA treks to my credit. We wouldn't see anybody for the entire trip. I check out your site on a daily basis ... now I'm anxiously awaiting the coming posts. Hurry up ... I can't wait. Thx! wow. that is gorgeous. that blue!